Did you forget to take your medication again? That habit should not happen again. According to the National Council on Patient Information and Education, non-adherence to your regular medication can result in unnecessary progression of illness, decreased quality of life, and even untimely fatality. 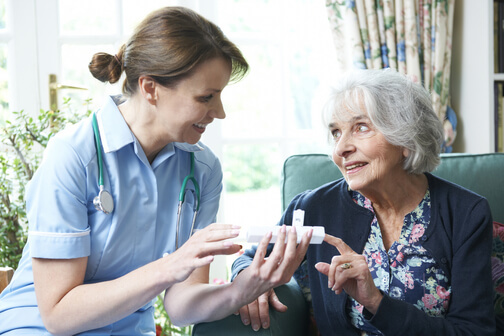 As a provider of In home care services in Oakland Counties, Michigan, we are completely aware of the dire consequences of medication non-adherence. It’s for this reason that we put a high value on providing quality basic care services to our clients, and medication management is one of them. Your senior loved one can deal with many age-related factors that will result to non-adherence of medication schedule. This is not ideal for their condition. Thanks to technology, you can now purchase gadgets with talking reminders or mobile phones with alarms. These technological innovations can best aid seniors who are easily forgetful or patients who have many other activities within the day. You can check many options for these gadgets online. The beauty of pill organizers is their labeling. Some organizers even have labels for days and hours, which are very handy for seniors who need to take pills at specific times of the day. The empty box in the organizer can give you a visual proof that you have taken the pills correctly and on schedule. Our day-to-day routines become part of our life system, like the way we breathe. If we’ve been doing something repeatedly for a long period of time, there’s an acute chance you’ll even miss it. Why not integrate your medication intake in these routines, such as right after breakfast or before taking a bath? Pharmacies are part of your healthcare team, along with your care providers of personal care services in Southeast Michigan. Your pharmacists can ensure that you always have medication even before your pills run out. When you enroll in their auto-refill services, they will see to it that you always have your medication right when you need it. Some seniors can’t physically handle their medicines or even take them on their own due to age-related limitations. When you request for a caregiver from an in home care assistance in Southeast Michigan, you will have someone to ensure that you take the necessary medications right on time and in the right dosage. With timely medication adherence, your loved one’s health can be enhanced by leaps and bounds. Medication is part of a seniors’ daily life. Don’t let non-adherence become a mistake or habit. If you need a personal care assistant for your senior family member at home, you can request us at Heaven Sent Home Support Services. We have well-trained and compassionate home care aides ready to serve your loved one. Don’t think twice of contacting us. This entry was posted in Home Health Aide and tagged Elderly Care, Healthcare, In-Home Care. Bookmark the permalink.